Residents of Hawaii were up for a rough awakening last Saturday morning when their phones blasted off the one warning you'll never want to hear - the emergency alert that an intercontinental ballistic missile is incoming to the beautiful pacific archipelago. Luckily for humankind, the chilling warning turned out to have been mistakenly triggered by a state employee that chose the wrong option from a drop-down menu and sent the state of Hawaii in grave panic for more than 40 minutes. 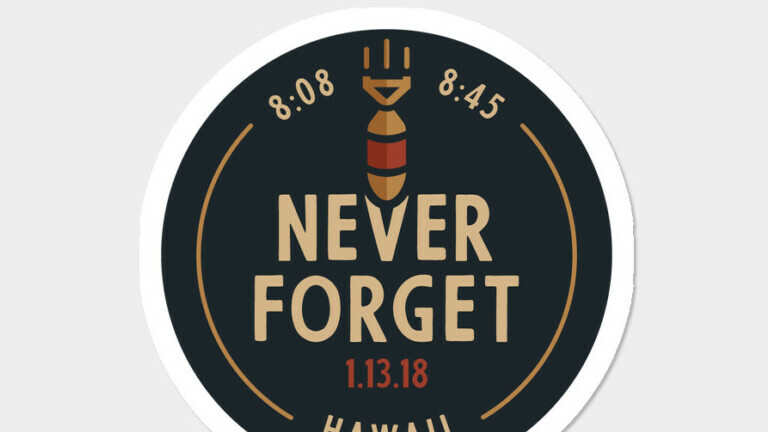 A human mistake scared the state of Hawaii that World War III had kicked off, and hopefully we wouldn't need another human juggernaut to prevent it. Unlike during the Cold War when you had to solely rely on the Civil defense system, in this day and age our phones (and SIM-enabled smartwatches like the Apple Watch) would alert us of any impending emergency as soon as it's detected. Thanks to the WEA (Wireless Emergency Alerts) network, almost any phone or pager you could possibly have will promptly alert you of any urgent alerts issued by the President of the United States, alerts involving imminent threats to safety of life (extreme threats or severe threats), and finally, AMBER alerts. While it's possible for smartphone users to prevent their devices from alerting them about any of these by disabling a slew of settings, it's imperative to understand that you should by no means do that as it could potentially save your life and the lives of all the people you care about. What we'll do here today is try and double-check that all of your emergency/AMBER settings on your phone are up and running as intended. Rest assured that by default they are turned on and are actually well-hidden, though there's always a chance that something has gone haywire or a wrong-doer has messed up with your device. As we mentioned above, these alerts are absolutely crucial and you need to make sure that you have them enabled. On both iOS and Android, emergency alerts will usually blast at full volume and won't comply with any do-not-disturb modes or rules you might have set up. As long as your phone has enough battery to function, it will go off at its maximum - that's the intended behavior that naturally aims to attract your attention as fast as possible. 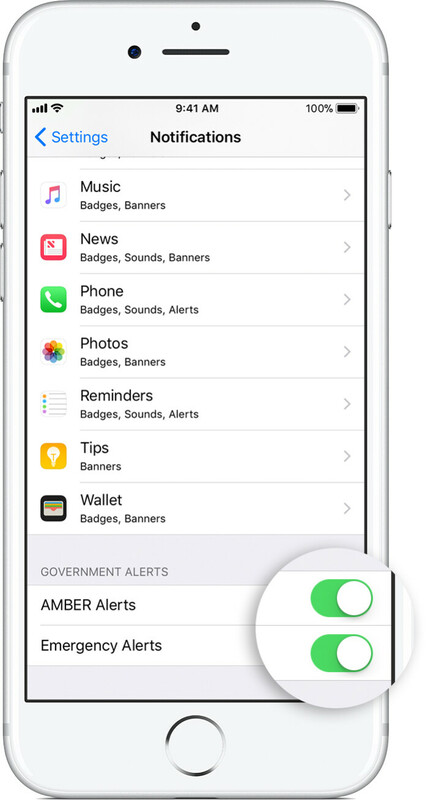 If you're living in the US and rocking an iPhone, which is a rather logical thing to assume, then you'd find the emergency/AMBER alerts menu tucked in Settings > Notifications, and then at the bottom of the latter menu, you'll find Government alerts. Make sure both emergency and AMBER alerts are enabled. If you have an Apple Watch paired with an iPhon, it should also mirror any emergency/AMBER alerts that you might receive on your phone. If there's no iPhone in the vicinity but the Apple Watch is hooked up to a Wi-Fi network, it will also receive the alerts. If you have one of the latest stand-alone Series 3 Apple Watches that have a nano-SIM inside, you will also receive alerts. Open your SMS/main messaging app, go to its settings page, and go through all the menus inside until you stumble upon Cell Broadcasts or Wireless alerts. As we mentioned in the iOS section, you'll probably want everything here to be enabled. The good thing here is that you have a little more granular options on what to get alerted about and how. You can disable/enable a vibration alert or even set a reminder that will continuously blast off the last alert every 2 or 15 minutes. I'd have wet my pants, AT LEAST! Pooped, probably. Worse, I'd have died of a heart attack. My old little heart can only take so much! I could see many people celebrating my death here! Too bad (for you), it didn't occur in The Land of The Kangaroos! Oh well, G'Day! Petty much sums up 95% of all reactions to that notification! What's the point of a nuke notification on an island? Everyone there would be toast! For the most part yeah. But i'm sure there are some sort of bomb shelters and things like that on the islands. Carrier locked handsets can't turn off presidential notifications. So the last thing all you trump haters would read before it all ends, would be a message from him hahaha. You sound pleased by that realization. Why?